Cemetery as Early as 1786. Jews Elected to City Council. In Public and Professional Life. Port of entry and principal city of the state of Maryland, situated on an estuary of the Patapsco river about 12 miles from Chesapeake bay. It can not be determined when Jews first settled in Baltimore. There were none among the buyers of lots when Baltimore Town was laid out in 1729-30; but as Jews are known to have been resident in Maryland in the middle of the seventeenth, century (see America), it is not hazardous to suppose that the quickly growing town attracted some of their descendants early in its history. Family traditions, not yet verified, seem to point to the presence of Jews in Baltimore in the middle of the eighteenth century. 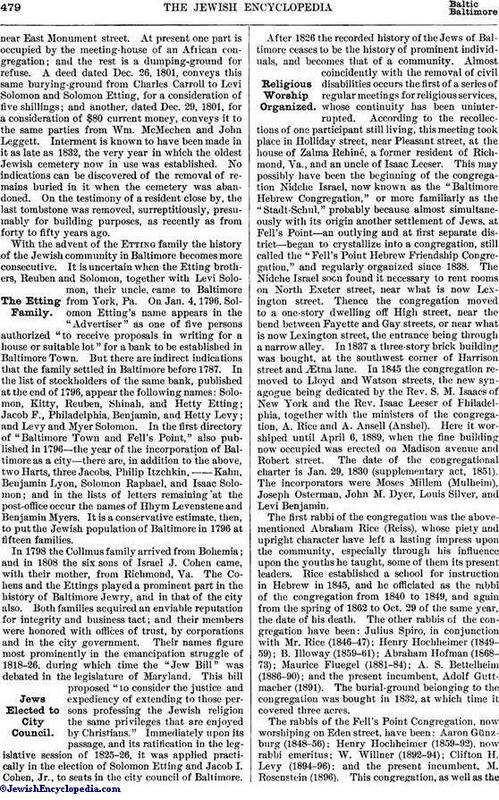 In his "The Hebrews in America" (p. 93), Isaac Markens mentions Jacob Myers as the earliest Jew in Baltimore, probably basing his assertion upon the following passage from Griffith's "Annals of Baltimore" (1824), p. 37: "In 1758 Mr. Jacob Myers took the southeast corner of Gay and Baltimore streets and built an inn." There is reason to believe, however, that Myers was not a Jew. "The Maryland Journal and Baltimore Advertiser"—the earliest paper published in Baltimore—the first issue of which appeared in 1773, shows by its advertisements for that year that Jews were then settled in Baltimore as traders, especially in West Indian products. The most substantial of these merchants apparently was Benjamin Levy, probably the same mentioned in the "Publications of the American Jewish Historical Society" (i. 21). In 1781 Jacob Hart, father-in-law of Haym M. Salomon, headed a subscription of £2,000 ($10,000) loaned to Lafayette for the relief of the detachment under his command. (From a photograph. )Cemetery as Early as 1786. The existence of a Jewish cemetery in 1786 indicates a Jewish community of some size. How long previous to that year the cemetery had been established is not known. The earliest mention of it occurs in a document (in the possession of Mr. Mendes Cohen of Baltimore), dated July 12, 1786, headed "Mr. Carroll's [Charles Carroll of Carrollton] claims." It is a "list of the names of the Persons who occupy the ground (supposed to be about 2 acres) on the east side of Jones's Falls, . . . with an account of the improvements." One of the items is "The Jews burying-ground, 1 small lot enclosed," situated in Ensor's Town, now Jew alley,near East Monument street. At present one part is occupied by the meeting-house of an African congregation; and the rest is a dumping-ground for refuse. A deed dated Dec. 26, 1801, conveys this same burying-ground from Charles Carroll to Levi Solomon and Solomon Etting, for a consideration of five shillings; and another, dated Dec. 29, 1801, for a consideration of $80 current money, conveys it to the same parties from Wm. McMechen and John Leggett. Interment is known to have been made in it as late as 1832, the very year in which the oldest Jewish cemetery now in use was established. No indications can be discovered of the removal of remains buried in it when the cemetery was abandoned. On the testimony of a resident close by, the last tombstone was removed, surreptitiously, presumably for building purposes, as recently as from forty to fifty years ago. With the advent of the Etting family the history of the Jewish community in Baltimore becomes more consecutive. It is uncertain when the Etting broth ers, Reuben and Solomon, together with Levi Solomon, their uncle, came to Baltimore from York, Pa. On Jan. 4, 1796, Solomon Etting's name appears in the "Advertiser" as one of five persons authorized "to receive proposals in writing for a house or suitable lot" for a bank to be established in Baltimore Town. But there are indirect indications that the family settled in Baltimore before 1787. In the list of stockholders of the same bank, published at the end of 1796, appear the following names: Solomon, Kitty, Reuben, Shinah, and Hetty Etting; Jacob F., Philadelphia, Benjamin, and Hetty Levy; and Levy and Myer Solomon. In the first directory of "Baltimore Town and Fell's Point," also published in 1796—the year of the incorporation of Baltimore as a city—there are, in addition to the above, two Harts, three Jacobs, Philip Itzchkin,—Kahn, Benjamin Lyon, Solomon Raphael, and Isaac Solomon; and in the lists of letters remaining at the post-office occur the names of Hhym Levenstene and Benjamin Myers. It is a conservative estimate, then, to put the Jewish population of Baltimore in 1796 at fifteen families. In 1798 the Collmus family arrived from Bohemia; and in 1808 the six sons of Israel J. Cohen came, with their mother, from Richmond, Va. The Cohens and the Ettings played a prominent part in the history of Baltimore Jewry, and in that of the city also. Both families acquired an enviable reputation for integrity and business tact; and their members were honored with offices of trust, by corporations and in the city government. Their names figure most prominently in the emancipation struggle of 1818-26, during which time the "Jew Bill" was debated in the legislature of Maryland. This bill proposed "to consider the justice and expediency of extending to those persons professing the Jewish religion the same privileges that are enjoyed by Christians." Immediately upon its passage, and its ratification in the legislative session of 1825-26, it was applied practically in the election of Solomon Etting and Jacob I. Cohen, JR., to seats in the city council of Baltimore. After 1826 the recorded history of the Jews of Baltimore ceases to be the history of prominent individuals, and becomes that of a community. Almost coincidently with the removal of civil disabilities occurs the first of a series of regular meetings for religious services, whose continuity has been uninterrupted. According to the recollections of one participant still living, this meeting took place in Holliday street, near Pleasant street, at the house of Zalma Rehiné, a former resident of Richmond, Va., and an uncle of Isaac Leeser. This may possibly have been the beginning of the congregation Nidche Israel, now known as the "Baltimore Hebrew Congregation," or more familiarly as the "Stadt-Schul," probably because almost simultaneously with its origin another settlement of Jews, at Fell's Point—an outlying and at first separate district—began to crystallize into a congregation, still called the "Fell's Point Hebrew Friendship Congregation," and regularly organized since 1838. The Nidche Israel soon found it necessary to rent rooms on North Exeter street, near what is now Lexington street. Thence the congregation moved to a one-story dwelling off High street, near the bend between Fayette and Gay streets, or near what is now Lexington street, the entrance being through a narrow alley. In 1837 a three-story brick building was bought, at the southwest corner of Harrison street and Ætna lane. In 1845 the congregation removed to Lloyd and Watson streets, the new synagogue being dedicated by the Rev. S. M. Isaacs of New York and the Rev. Isaac Leeser of Philadelphia, together with the ministers of the congregation, A. Rice and A. Ansell (Anshel). Here it worshiped until April 6, 1889, when the fine building now occupied was erected on Madison avenue and Robert street. The date of the congregational charter is Jan. 29, 1830 (supplementary act, 1851). The incorporators were Moses Millem (Mulheim), Joseph Osterman, John M. Dyer, Louis Silver, and Levi Benjamin. The first rabbi of the congregation was the above-mentioned Abraham Rice (Reiss), whose piety and upright character have left a lasting impress upon the community, especially through his influence upon the youths he taught, some of them its present leaders. Rice established a school for instruction in Hebrew in 1845, and he officiated as the rabbi of the congregation from 1840 to 1849, and again from the spring of 1862 to Oct. 29 of the same year, the date of his death. The other rabbis of the congregation have been: Julius Spiro, in conjunction with Mr. Rice (1846-47); Henry Hochheimer (1849-59); B. Illoway (1859-61); Abraham Hofman (1868-73); Maurice Fluegel (1881-84); A. S. Bettelheim (1886-90); and the present incumbent, Adolf Guttmacher (1891). The burial-ground belonging to the congregation was bought in 1832, at which time it covered three acres. The rabbis of the Fell's Point Congregation, now worshiping on Eden street, have been: Aaron Günzburg (1848-56); Henry Hochheimer (1859-92), now rabbi emeritus; W. Willner (1892-94); Clifton H. Levy (1894-96): and the present incumbent, M. Rosenstein (1896). 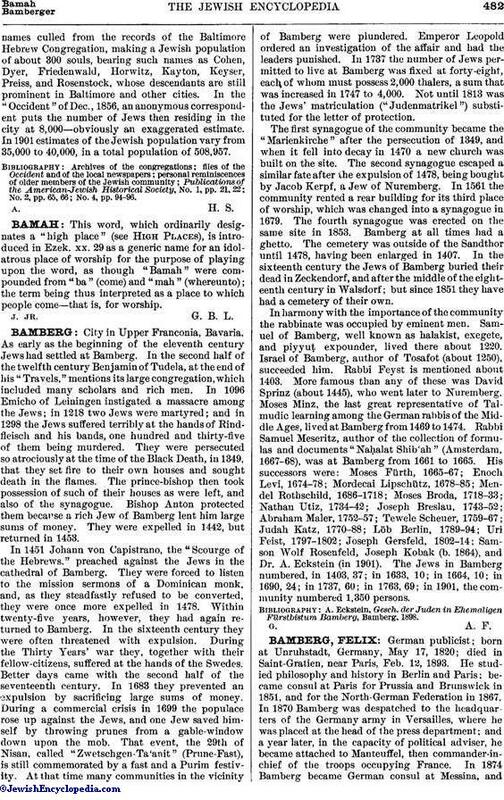 This congregation, as well as thethe one or two "ḥebrot" of which records up to 1842 have been preserved, had separated from, or organized themselves independently of, the mother congregation, Nidche Israel, only for reasons of convenience, on account of the extended space over which the community was scattered. In 1842 the desire for a radical change in the liturgy resulted in the formation of the Har Sinai Verein, whose rabbis have been: Max Sutro (about 1842); Moritz Brown (about 1849-55); David Einhorn (1855-61); S. Deutsch (1862-73); Jacob Mayer (1874-76); E. G. Hirsch (1877-78); S. Sale (1878-83); David Philipson (1884-88); Tobias Shanfarber (1888-98); and the present incumbent, Charles A. Rubenstein (1898). The congregation recently erected a new house of worship on Bolton and Wilson streets. A similar desire for a revised liturgy, but along more conservative lines, led to the formation of the Oheb Shalom Congregation in Sept., 1853, on the part of a number of dissidents from the original body. The rabbis of this congregation, whose new synagogue on Eutaw place and Lanvale street is considered one of the most beautiful structures in the city, have been the following:—Salomon (1854); S. M. Landsberg (1856-57); Benjamin Szold, now rabbi emeritus (1859-92); and the present incumbent, William Rosenau (1892). Alois Kaiser, known as a composer of synagogue music, has been the cantor of this congregation since 1866. This was followed by the formation of three Orthodox congregations, the earliest of which was the Bikur Cholim Congregation, incorporated in 1865. 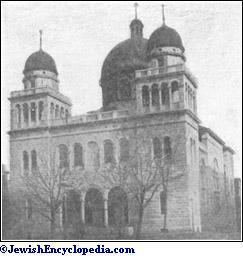 The Chizuk Emoonah Congregation was formed in 1871 by dissidents from the Baltimore Hebrew Congregation, which had begun to introduce innovations into the synagogue service. The only rabbi of the Chizuk Emoonah has been Henry W. Schneeberger, who has occupied the rabbinate since 1876. A new synagogue has recently been built by the congregation at McCulloh and Mosher streets. In 1878, the Shearith Israel Congregation was formed by the consolidation of two small congregations. S. Schaffer has been its rabbi since 1893. Since then, in the organization of the twenty other congregations existing in Baltimore,—only eight of which have a house of worship of their own,—the determining factor, in a few cases, has been convenience of locality, but more frequently the bond of national affiliation brought from European countries and reenforced by conservatism in religious sentiment. An attempt was made in 1856-59 to hold services according to the liturgy of the Sephardim, of which S. N. Carvalho was the chief promoter. The congregation was regularly organized in 1857, under the name "Beth Israel," with Jacob M. De Solla as minister. This completes the religious history of the community. Of the eight large cemeteries in the city, one, called "Rosedale," is used by seven congregations and three societies; another, on the Philadelphia road, by eight congregations and two societies; and a third, on the Washington road, by three congregations and one society. Each of five congregations, the Baltimore Hebrew, the Fell's Point, the Har Sinai, the Oheb Shalom, and the B'nai Israel, has a cemetery of its own. Besides, there is a small cemetery, now disused, on the Philadelphia road, which was formerly maintained by what was called, for unknown reasons, "Die Irische Ḥebra." The Cohen family and the Etting family own private cemeteries. The first charitable association was the Hebrew Assistance Society (1843? ), incorporated in 1856 as the "Hebrew Benevolent Society of Baltimore." In the latter year was founded also the Hebrew Ladies' Sewing Society, which, though an independent body, has always adapted its activities to those of the general organization. The building of the Hebrew Hospital and Asylum Association—a society for the care of the sick and the shelter of the aged—was dedicated in 1868, the first steps toward this end having been taken in 1859; and in 1872 the Hebrew Orphan Asylum, which now cares for seventy-five inmates, was established. Both these institutions have active auxiliary organizations. The other charitable institutions with permanent homes are the Hebrew Friendly Inn and Aged Home, established in 1891, and the Working Girls' Home, founded in 1899 by the Daughters in Israel, and supported by that association. There are, besides, two Hebrew free burial societies, a Hebrew free loan association, the Daughters in Israel of Baltimore City (a personal service sister-hood with various activities), and a number of mutual benefit and relief associations. The Baron de Hirsch Fund from the first established a local committee in Baltimore whose affairs have been administered by Dr. A. Friedenwald. 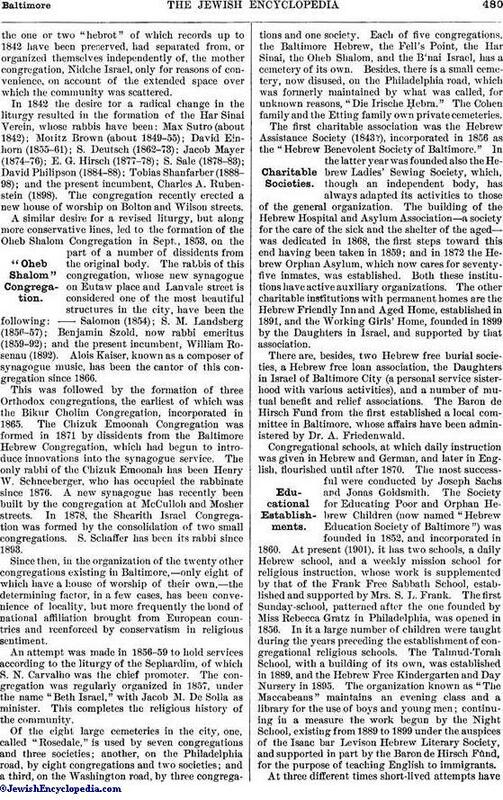 Congregational schools, at which daily instruction was given in Hebrew and German, and later in English, flourished until after 1870. The most successful were conducted by Joseph Sachs and Jonas Goldsmith. The Society for Educating Poor and Orphan Hebrew Children (now named "Hebrew Education Society of Baltimore") was founded in 1852, and incorporated in 1860. At present (1901), it has two schools, a daily Hebrew school, and a weekly mission school for religious instruction, whose work is supplemented by that of the Frank Free Sabbath School, established and supported by Mrs. S. L. Frank. The first Sunday-school, patterned after the one founded by Miss Rebecca Gratz in Philadelphia, was opened in 1856. In it a large number of children were taught during the years preceding the establishment of congregational religious schools. The Talmud-Torah School, with a building of its own, was established in 1889, and the Hebrew Free Kindergarten and Day Nursery in 1895. The organization known as "The Maccabeans" maintains an evening class and a library for the use of boys and young men; continuing in a measure the work begun by the Night School, existing from 1889 to 1899 under the auspices of the Isaac bar Levison Hebrew Literary Society, and supported in part by the Baron de Hirsch Fund, for the purpose of teaching English to immigrants. At three different times short-lived attempts havebeen made to maintain Young Men's Hebrew associations, the first of which existed from 1854 to 1860. At present there are several clubs, three with club-houses, and a number of pleasure societies and literary and musical associations. There are three Zionist societies; a branch of the Alliance Israélite Universelle; a section and a junior section of the Council of Jewish Women; six lodges of the Independent Order B'nai B'rith; three of the Independent Order B'rith Abraham; one of the Independent Order Free Sons of Israel; three of the Independent Order Free Sons of Judah; four of the Independent Order Sons of Benjamin; five of the Order Ahawas Israel; seven of the Order B'rith Abraham; and one of the Order Kesher Shel Barzel. 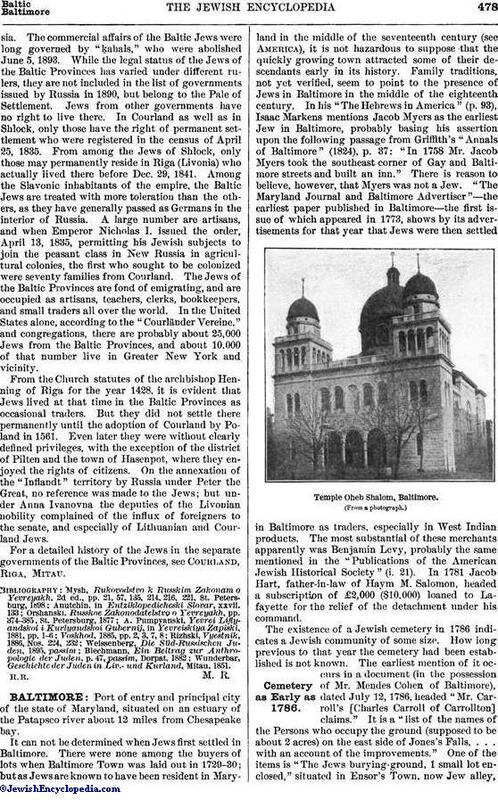 The Jewish newspapers published in Baltimore have been the following: "Sinai" (a German periodical, edited by Dr. D. Einhorn, 1856-61, and one year in Philadelphia); "The Jewish Chronicle" (1875-77); "Der Fortschritt" (Yiddish, June-July, 1890); "Der Baltimore Israelit" (Yiddish, 1891-93); "Ha-Pisgah" (Hebrew, 1891-93, continued in Chicago); "Jewish Comment" (1895); and "Der Wegweiser" (Yiddish, 1896). The Jews of Baltimore have participated fully in the civic life of the town and the state, and have taken some part in national affairs. In the city, Jews have filled numerous minor offices, notably as councilmen, justices of the peace, supervisors of elections, and in the city law department, as well as on boards and special commissions. Myer Block is judge of the Orphans' Court in Baltimore; Jacob H. Hollander was secretary to the International Bimetallic Commission, and the first treasurer of Porto Rico under American jurisdiction. Isidor Rayner served as representative in the fiftieth, the fifty-second, and the fifty-third congresses, after having sat in the House of Delegates and the Senate of the state; at present he is attorney-general of the state. Among the state senators have been Jacob M. Moses and Lewis Putzel; and among the delegates the following: Mendes I. Cohen, Martin Emerich, Harry A. Fuld, M. S. Hess, Emanuel H. Jacobi, Martin Lehmayer, Lewis Putzel, and Charles J. Wiener. In the business world the Jews of Baltimore occupy an important position. The clothing manufacturing trade is entirely in their hands, and to a great extent they control the manufacture of all wearing apparel for men, including straw hats. Several of the largest department stores are conducted by Jews; and as financiers they bear an enviable reputation for probity and for a spirit of far-sighted and cautious enterprise. Baltimore Jews have had prominent representatives in all the professions. Jewish physicians, men and women, have occupied positions as professors in the medical colleges, among whom may be mentioned A. B. Arnold, Joshua I. Cohen, Aaron Friedenwald, Harry Friedenwald, and Julius Friedenwald; a few Jews have devoted themselves to the writing of medical and legal works; there are Jewish journalists on the editorial staffs of several of the daily newspapers; the following Jews have been connected with Johns Hopkins University in the capacity of professors and instructors: J. J. Sylvester, Fabian Franklin, Abraham Cohen, Maurice Bloomfield, Cyrus Adler, J. H. Hollander, Simon Flexner, Caspar Levias, and William Rosenau; in the public schools upward of sixty Jewish teachers are employed; Ephraim Keyser has won reputation as a sculptor, and Mendes Cohen as a civil engineer. The wider educational life has found promoters among the Jews. Jacob I. Cohen, JR., was active in the establishment of the public-school system of Baltimore; and his nephews were instrumental in placing in the Johns Hopkins University the "Cohen Collection of Egyptian Antiquities," collected by his brother, Col. Mendes I. Cohen, in Egypt. At the same university Leopold Strouse established a rabbinical library, to which he makes annual additions; Mrs. S. L. Frank and Albert W. Rayner have founded a Semitic fellowship in memory of their father, William S. Rayner; and Henry and Mrs. Sonneborn have presented the university with a collection of Jewish ceremonial objects. At the Cohen residence is a library valuable to Bible students, collected by Dr. Joshua I. Cohen (a catalogue of this library, compiled by Cyrus Adler, was privately printed in 1887). Jews enlisted from Baltimore for service in each of the national wars. Nathaniel Levy fought under Lafayette in the campaign of 1781; and Reuben Etting (not the one mentioned above) was taken prisoner by the British at Charlestown. Among the defenders of Fort McHenry, near Baltimore, during the War of 1812-14, were the brothers Mendes I. and Philip I. Cohen. In the Mexican war, Moritz Henry Weil served as a private in Company A, Third Regiment, United States Artillery, and Louis Hamburger as a private in Company C, Baltimore Battalion. A company of militia composed entirely of Jews was formed, with Levi Benjamin as first lieutenant; but it is not probable that it saw active service. In the Civil war there were as many Baltimore Jews in the Confederate as in the Federal army. Leopold Blumenberg served as brevet brigadier-general, United States Volunteers, Fifth Maryland Infantry (see S. Wolf, "The American Jew as Patriot, Soldier, and Citizen," pp. 199, 200, 412). 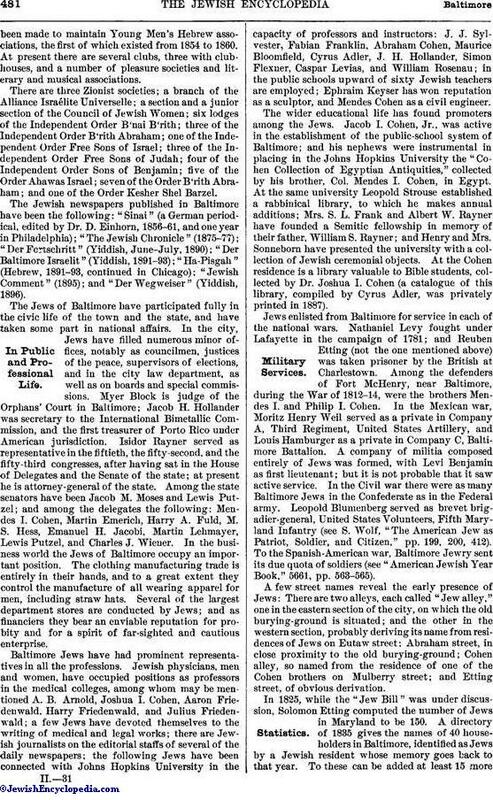 To the Spanish-American war, Baltimore Jewry sent its due quota of soldiers (see "American Jewish Year Book," 5661, pp. 563-565). A few street names reveal the early presence of Jews: There are two alleys, each called "Jew alley," one in the eastern section of the city, on which the old burying-ground is situated; and the other in the western section, probably deriving its name from residences of Jews on Eutaw street; Abraham street, in close proximity to the old burying-ground; Cohen alley, so named from the residence of one of the Cohen brothers on Mulberry street; and Etting street, of obvious derivation. In 1825, while the "Jew Bill" was under discussion, Solomon Etting computed the number of Jews in Maryland to be 150. A directory of 1835 gives the names of 40 householders in Baltimore, identified as Jews by a Jewish resident whose memory goes back to that year. To these can be added at least 15 morenames culled from the records of the Baltimore Hebrew Congregation, making a Jewish population of about 300 souls, bearing such names as Cohen, Dyer, Friedenwald, Horwitz, Kayton, Keyser, Preiss, and Rosenstock, whose descendants are still prominent in Baltimore and other cities. In the "Occident" of Dec., 1856, an anonymous correspondent puts the number of Jews then residing in the city at 8,000—obviously an exaggerated estimate. In 1901 estimates of the Jewish population vary from 35,000 to 40,000, in a total population of 508,957. Publications of the American-Jewish Historical Society, No. 1, pp. 21, 22; No. 2, pp. 65, 66; No, 4, pp. 94-96.